This is AB7, a binary star system found in one of the nearby Magellanic Cloud galaxies. The two stars are constantly venting massive amounts of stellar material. That process is heating up one of the stars to absolutely unimaginable temperatures. AB7 is a binary star, consisting of one WR-star - highly evolved massive star - and a mid-age massive companion of spectral type O. These exceptional stars have very strong stellar winds : they continuously eject energetic particles - like the "solar wind" from the Sun - but some 10 to 1,000 million times more intensely than our star. These powerful winds exert an enormous pressure on the surrounding interstellar material and forcefully shape those clouds into "bubbles", well visible in the photos by their blue colour. 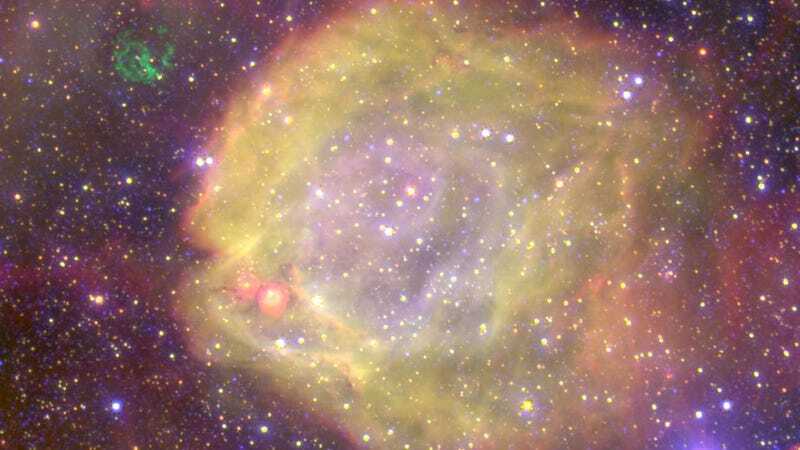 AB7 is particularly remarkable : the associated huge nebula and HeII region indicate that this star is one of the, if not THE, hottest WR-star known so far, with a surface temperature in excess of 120,000 degrees. Just outside this nebula, a small network of green filaments is visible - they are the remains of another supernova explosion.